Back in 2009 I was reading through the media jobs section of The Guardian on a Monday and I came across this job ad. It was headed ‘The Pen is Mightier than the Sword’. Reading the advert it became obvious that the job was to be a speechwriter for the Ministry of Defence. The non-ironic tagline was ‘A Force for Good’. I was so angry at the time. I cut out the job advert and stuck it in my diary with a few choice words of what I thought of it. 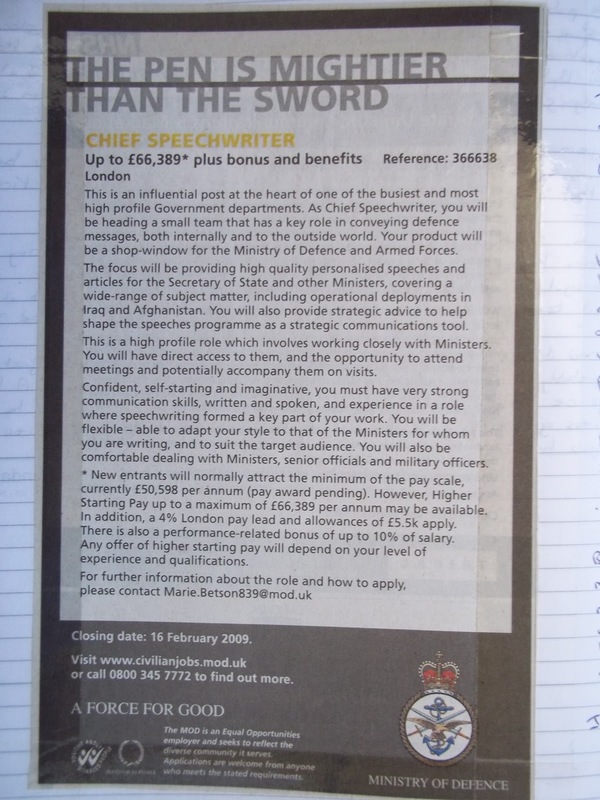 It wasn’t just that the Ministry of Defence were paying £66,389 (plus bonus and benefits) to the successful applicant, it was that they had appropriated the phrase: ‘The Pen is Mightier than the Sword’. I got over it of course. In this life you tend to do that – things will make you angry for a little while, but sometimes we are powerless to do anything about it and the anger goes away (and anyway, anger is such a bullying emotion). The problem is, naive as I am (and believe me, I have my naive moments), I still can’t get my head around the way that the pen and the sword work together. It seems to me that they are diametrically opposed to each other. The pen should promote peace. The whole point of having a principle like ‘the pen is mightier than the sword’ is to fight for peace using the written word. I keep reading articles in newspapers or hearing news reports on TV which are so uncritical of war that I find the old anger coming back again and again. And what right have I? I’m naive – we live in a world where reports in newspapers about subjects like the arms trade or the latest war are completely uncritical. That’s the way it is. What is the point of writing? What is the point of journalism? Is it to work with the status quo? Is it to re-enforce the latest political agenda? Is it to write propaganda? Or is it to try to ensure peace – to question, to criticize wars so that lives aren’t lost on both sides? What is the point of using a pen or keyboard? Is it to make things better or worse? I hope the person who eventually got the job has job satisfaction. The job does stipulate that such a person should be ‘imaginative’, so maybe they could imagine their way out of the cognitive dissonance that doing such a job should cause? Personally I think it would have been a Faustian moment for him (or her).